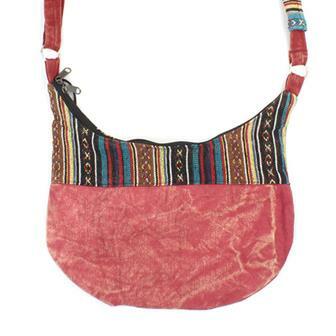 Find the perfect shoulder bag in this section! A great selection of fabrics and styles are available, all ethically sourced from our suppliers around the world. 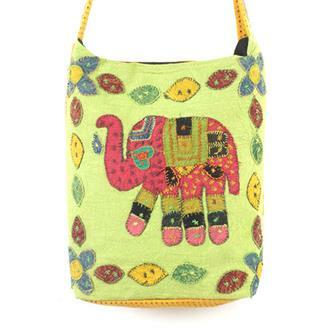 These eye catching, sturdy shoulder bags each have a sparkling, heavily sequinned and embroidered elephant design panel stitched on. With a single large lined and zipped main compartment, these bags are available in blue or black. Zip up main compartment and front pocket. 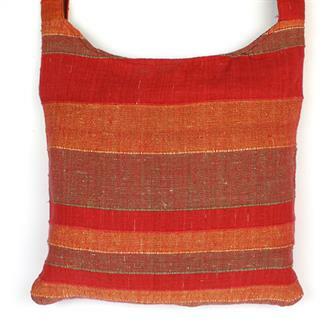 Simple cotton shoulder bag, made from Indian bedspread. Available in a variety of colours, so if you have a preference please leave instructions at time of ordering. Zip up main compartment with internal pocket. Heavy stonewashed cotton bag with various mixed trim patterns. 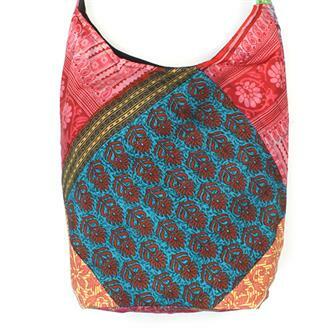 The bag has an internal lining with a zipped pocket as well as small purse which is sewn in and adjustable straps. 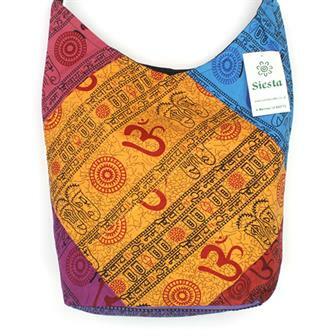 Vibrant bag made with patches of wonderful eye catching swirly fabric in varying colours. 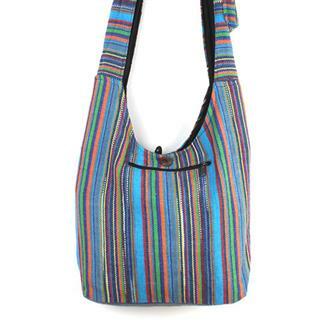 This generous bag has a main lined zip compartment with internal pocket and adjustable strap. 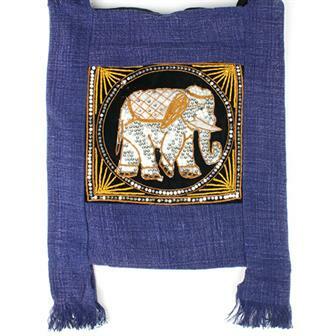 These beautiful, elegant bags are made with remnants of sari fabric to create one of a kind items. Generously sized, each bag has a main lined zip compartment with internal pocket and adjustable strap. All patch colours & patterns vary. 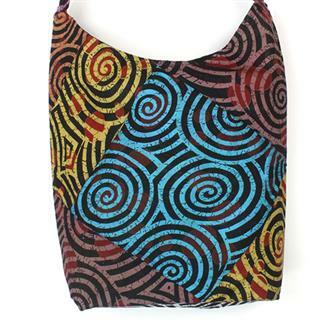 Bold bag made with patches of this eye catching fabric in varying colours. 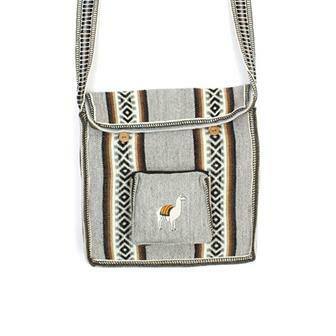 This generous bag has a main lined zip compartment with internal pocket and adjustable strap. 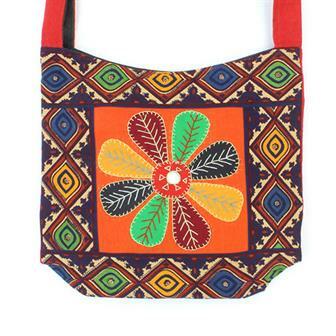 These lovely shoulder bags incorporate a section of beautiful Indian fabric. Spacious and strong, these bags are perfect for everyday use. 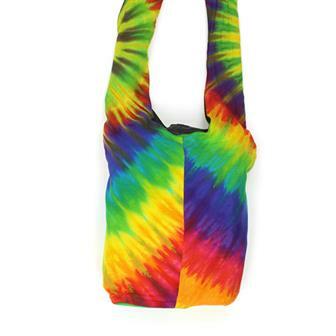 Beautifully bright and vividly vibrant, these rainbow tie dyed bags are a great eye catching accessory. 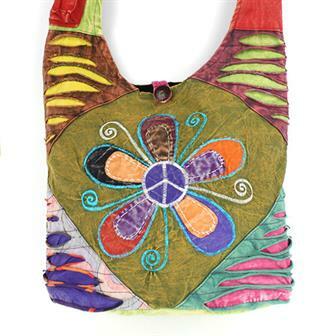 This lovely colourful bag has a hippy design with CND and flower patches. 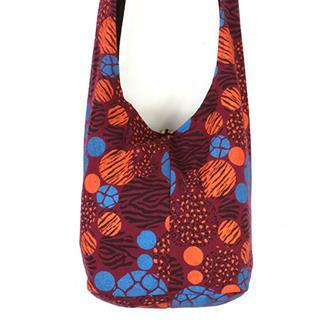 The inside of the spacious shoulder bag is lined with black cotton. 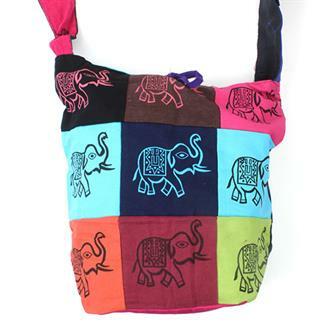 A lovely bright cotton patchwork shoulder bag, with each patch printed in an elephant design. This lined bag has a small internal pocket inside the main zipped compartment and another small Velcro pocket on the strap. Handmade in India, these long strapped shoulder bags feature a beautiful and intricate flower motif made of embroidered peacock feathers. The flower is bordered by floral fabric and centred with a small mirror. 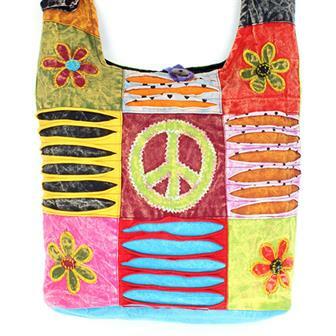 Feature bright and colouful fabrics and a distinctive ripped cotton style, these eye catching shoulder bags have a peace symbol centred flower as their main decoration. 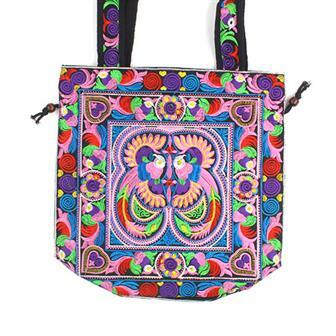 Beautiful Indian made shoulder bags, each featuring a bright and colourful elephant motif in the centre and finished with hand stitched decoration and tassles. 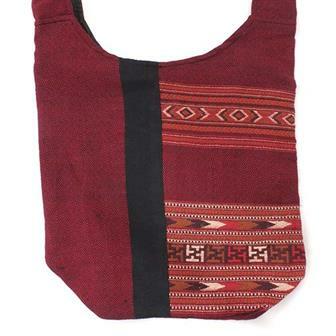 Handmade by members of the Hmong hill tribe population in Northern Thailand, these eye-catching and vivid shoulder bags have a sturdy drawstring and a zipped interior pocket. These brilliantly colourful gheri cotton bags are ideal for taking to class with ample space for A4 papers, books and stationery. The bags also have a special velcro pocket on the strap for a phone or mp3 player. 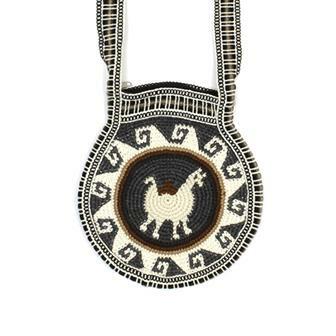 These beautiful shoulder bags are made from a terrific, eye catching material. Each one is handmade in Nepal. 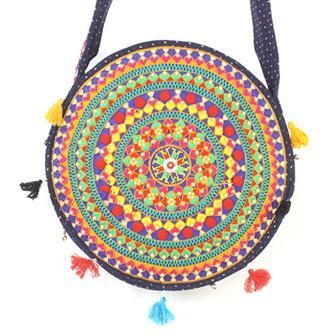 Incredibly colourful circular shoulder bag made in with a panel of traditional Rajasthan patterned fabric.Completed with colourful dotted fabric and adorned with tiny bells and beaded tassels.